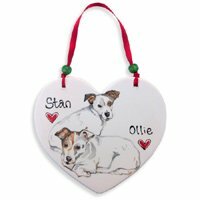 Wonderful pet portrait dog keyring or handbag charm to show off your best friend or remember a beloved pet who is no longer with you. These are great as a charm for your handbag or to keep your keys on. 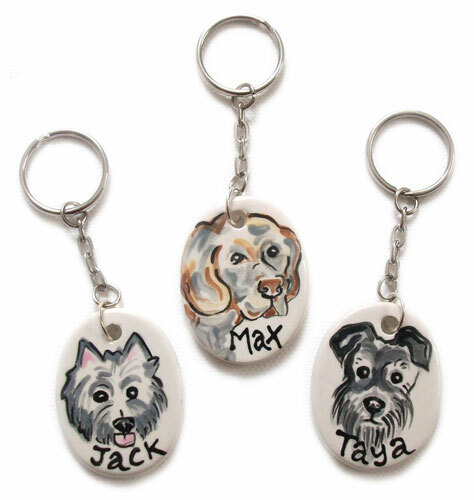 Each keyring charm is ceramic and beautifully hand painted with the artist's representation mini portrait of your dog and personalised with their name. On the back is a little rustic red heart. UK hand painted. 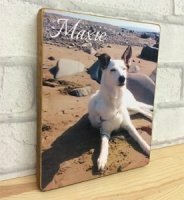 A truly unique keepsake or gift for yourself or a dog loving friend. 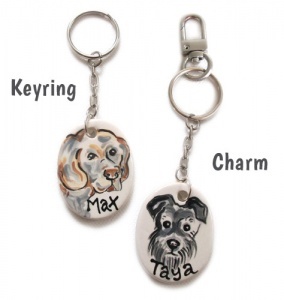 The ceramic charm measures approx. 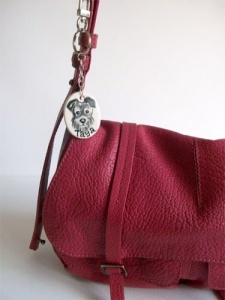 4.5cm in length and 3.5cm across and can be attached to keys or a handbag strap. 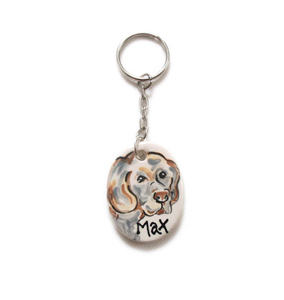 I purchased this charm as a gift for a friend whose dog had passed away. The charm is very like the dog, they have caught his essence. The customer service is fab. I have just received a key ring as a gift and am absolutely delighted with it. Will definitely be recommending to friends and family. 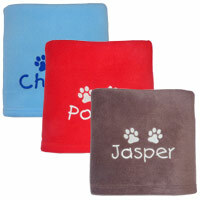 The product was amazing, finished to a very high quality. I was greatly impressed with this, and my friend loved it. 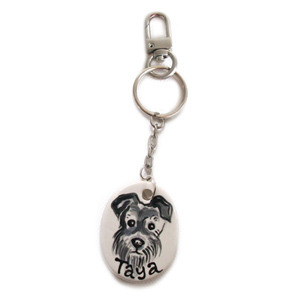 Bought a key ring for my Mum for Xmas , it has a picture of her Westie Lily on it. I’m so impressed with the likeness I really wasn’t expecting it to be so good. Really chuffed with it and I know my mum is going to love it. Will definitely be ordering more things. Thank you. Very pleased with the key ring however rather expensive. 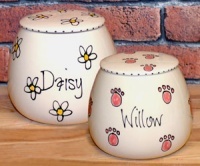 When a close friend's dog passed away I wanted to get her a gift and this was perfect. The artist really got a great likeness of my friends dog and she absolutely loved it. 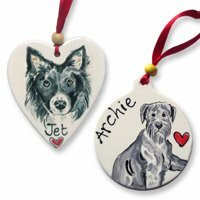 They were quick to answer any queries I had and it arrived within the time they stated, you can't rush art! Yes it is cartoon-y, I've seen complaints about that but I feel that's obvious from the description so if that's not what you buy a photo piece from the website. I am so sorry to hear you are not happy with the artwork. Comparing the finished product to your original photos, they have been done in the style shown and described. They are illustrations, not photographic portraits. Again, I am sorry if you were expecting something else.